Staying in town Labor Day weekend has many benefits. Not sitting in traffic, attending the U.S. open, and time for all those food projects, are among the main attractions. I love Vermont and upstate and swimming and grilling and hammocks, but once in a while a staycation can be just as restful and restorative. Yesterday I met my friend Laura, in town from D.C., for brunch. I like going out to eat with Laura, a vegan for at least the past two years, because it gives me the opportunity to venture out from the typical eggs-benedict brunch and try something a little more interesting, mindful. A bit of internet research, and a recommendation from my friend Jill, suggested Sun in Bloom, a small, sunny restaurant and cafe on Bergen Street in North Park Slope, near Flatbush Avenue. I think a lot of us have been scared off from restaurants that bill themselves as vegan, or gluten-free, or raw, let alone all three. Sun in Bloom is not one of those freaky deaky joints that serve lots of tvp or fake meat or unsalted greens. The only cliché about this place was Bob Marley on the sound system, which I didn’t mind at all. The space was bright, simple, and inviting. They have a rotating daily lasse or smoothie and yesterday it was a Blueberries & Cream Immunity Booster, made of coconut kefir and fresh blueberries. Also on the menu: an energizing & alkalizing raw greens oup of cucumber, romaine, parsley, avocado and lemon. I’ll have to go back to try that. Laura ordered the quiche with roasted tomatoes, shitake mushrooms, caramelized onions, kale, roasted garlic, and pepper flakes, with a side of parsnip hash, for $10. 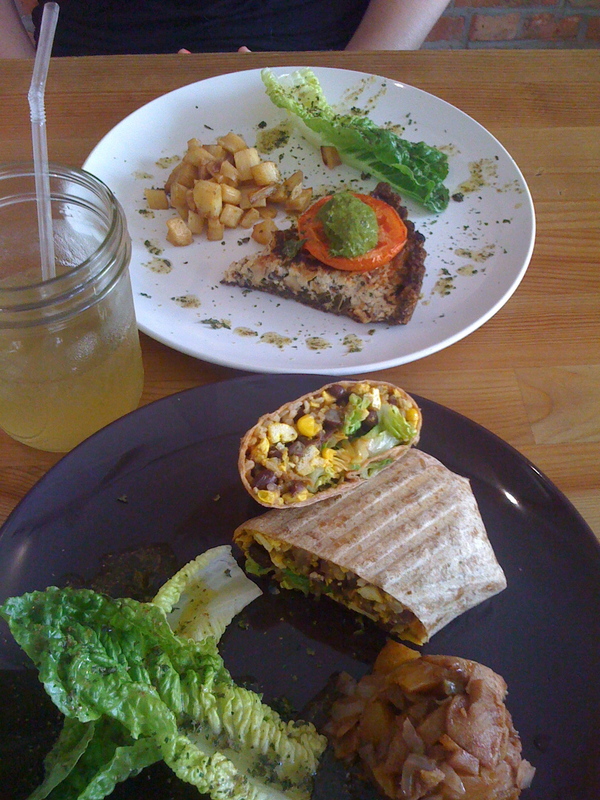 I had the “huevos rancheros” burrito with butternut squash hash; the burrito was filled with a spicy tofu scramble, greens, brown rice, and black beans, wrapped in an Ezekiel sprouted tortilla, for $10.50. Next time I’d also love to try the tempeh reuben and bloom burger. Earlier in the weekend I went to see the documentary El Bulli: Cooking in Progress, by the German Gereon Wetzel, about the famous Spanish restaurant, which closed its doors last month to much press and fanfare. 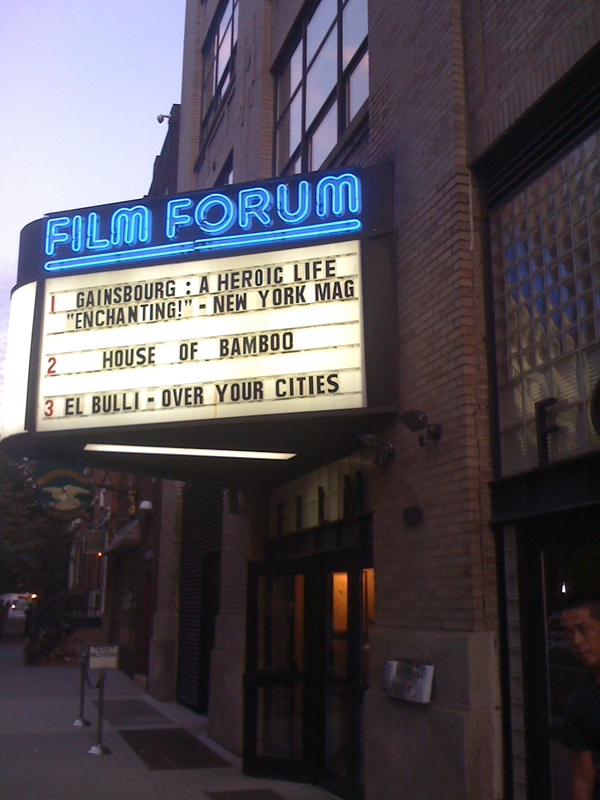 The film is a meditation on an idea. The creation of a dish from seed to flower, the deconstruction of a sweet potato, from root vegetable to juice to gnocchi. The art of the film was not so much in the technical savvy of the filmmaker, but in the way it shows artists at work, regardless of the profession. Yes these happen to be very skilled chefs in southern Spain, but they could’ve been painters or sculptors, architects or musicians. They begin with an idea for a dish, they mess up, there are trials and errors, but after six months of lab-testing in Barcelona in the winter, the chefs of el Bulli would come up with a hundred ideas for new dishes to present in the restaurant in springtime. The film does a good job of not treating the restaurant, or its star chef, Ferran Adrià, as too precious. The chefs make fun of themselves, and have fun, amidst all the seriousness and pressure. At one point, one of the chefs is meant to be serving an invented cocktail of oil and water, to be poured at the table; he discovers to his horror, mid-pour, he has brought a bottle of sparkling water instead of still water. You really feel for the guy as he’s recreating the tale back in the safety of the kitchen. Finally, tennis. 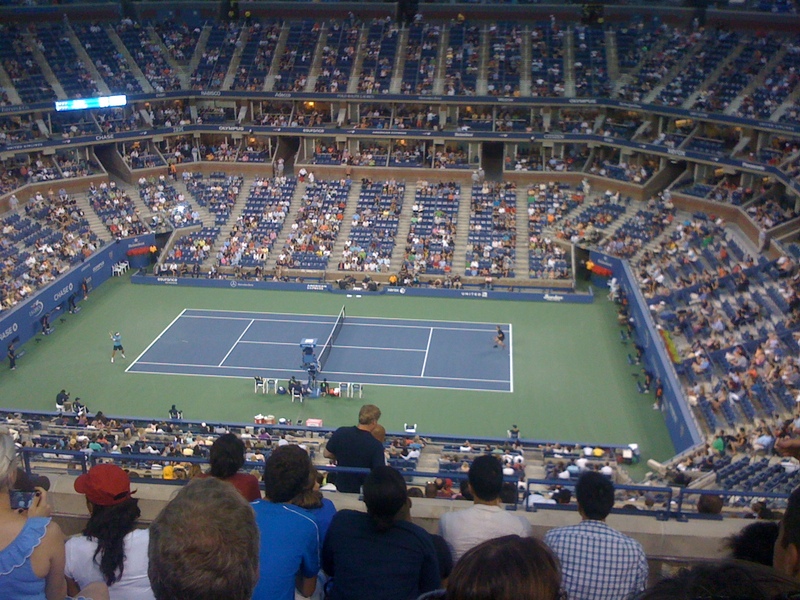 The U.S. Open started last weekend in Flushing, Queens and this was my first year to attend. I started playing tennis last summer and have gotten hooked on the game. This weekend I got to play on Saturday on Long Island, while visiting my grandmother, then watched a number of matches over the weekend, and attended two matches at Arthur Ashe stadium (the largest tennis venue in the world) Sunday night: the number-four men’s player in the world, Andy Murray from Scotland, who beat Feliciano Lopez; and the number-two women’s player, Vera Zvonareva, who beat the German Sabine Lisicki. Not much to say about the food I’m afraid, except as one friend put, why isn’t there a Shake Shack? Posts to follow soon on some food projects from this past weekend that I couldn’t fit in here. Look out. And go Rafa!